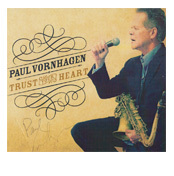 Released in June 2016, this is Paul’s first Trio Cd that includes vocals on every cut with Paul on vocals, sax/flute and congas accompanied by Gary Schunk on piano and Kurt Krahnke on bass. Song List of choice jazz standards includes: I’m Old Fashioned, All or Nothing At All, Moonlight in Vermont, You Stepped Out of a Dream, Only Trust Your Heart, Whisper Not, The Party’s Over, Lullaby of Birdland and Nature Boy. Romantic and reflective. 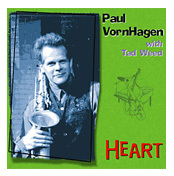 This 2014 recording features two original Vornhagen Compositions, “Jana” (bossa nova) and “Gia No Cry” (Cha cha/swing) in addition to arrangements on Dave Brubeck, Lee Morgan, Clifford Brown, Luiz Bonfa, Duke Jordan and more. 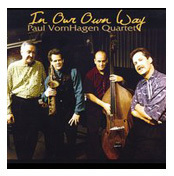 Paul performs on flute, tenor and soprano saxophones accompanied by his long time quartet band members Gary Schunk (piano), Kurt Krahnke (bass) and Randy Marsh (drums). There is a creative cohesiveness that is apparent in this Cd—everyone responds to each other in a supportive manner leading to a rich listening experience. “In Our Own Way” has been featured on the top syndicated NPR program, “Jazz After Hours” by the legendary host, Jim Wilke, as well as other jazz radio programs nationwide. Many jazz club performances by the quartet becomes apparent in the tight arrangements and versatility of jazz stylings. This CD was recorded in two sessions. The first features Cliff, Nick and Randy. The second session spotlights pianist Tad Weed, bassist Kurt Krahnke and drummer Pete Siers, who has performed on several of my previous CDs (and continues to inspire me). A myriad of emotions are explored within the folds of this album. Feel the thrill of love and the chill of love lost, the awe inspired by the redwood forest, the optimism born of a clear day and the wonder of a dark night. Enjoy these Kindred Spirits. Featuring pianist TAD WEED. A rich selection of 4 original instrumentals, 4 vocal standards and 5 instrumental arrangements of composers including Juan Tizol, Duke Ellington, Freddie Hubbard and Matt Dennis. 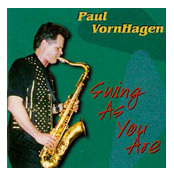 With PAUL VORNHAGEN on tenor, soprano, alto and baritone saxes, flute and vocals. GARY SCHUNK on piano and organ. PAUL FINKBEINER on trumpet and flugelhorn. JIMMY COOK on trumpet. PAUL KELLER on bass. RANDY MARSH on drums. Songs include originals Swing As You Are and Mulligan Man. Also Soy Califa (Dexter Gordon), Speak Low, Silver’s Serenade (H. Silver), I remember You, El Toro (W. Shorter), I’ve never been in Love before and Crazeology (Bud Powell). 1997 release recorded for SCHOOLKIDS RECORDS. 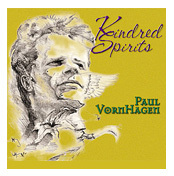 With PAUL VORNHAGEN on saxes, flute and vocals. GARY SCHUNK on piano and organ. JIMMY COOK on trumpet. KURT KRAHNKE on bass and RANDY MARSH and GERALD CLEAVER on drums. 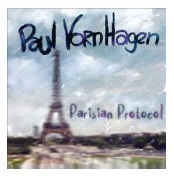 Songs include original compositions: Parisian Protocol, Cozy Does It, Montuna Salad and Rusty’s Theme. Also standards: They can’t take that away from me, Will you still be Mine, Bolivia (Cedar Walton), Hackensack (Monk), Blame it on my Youth, Crazy She Calls Me. 1995 release for SCHOOLKIDS RECORDS. 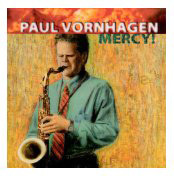 With PAUL VORNHAGEN on saxes, flute and vocals. RICK ROE and PHIL KELLY on piano. JIMMY COOK on trumpet. KURT KRAHNKE on bass and PETE SIERS on Drums. Songs include original tunes: Warmin’ up the House, Springwatch, Swingstick and Groovnik. Also standards such as: Makin Whoopee, Ask me Now (T. Monk), I get a kick outta you, This can’t be Love, You’d be so nice to come home to. 68 minutes in length.